Researchers from the Russian Academy of Sciences have presented contradicting assessments of France’s deal with Egypt on the purchase of Mistral ships. MOSCOW (Sputnik) – Researchers from the Russian Academy of Sciences (RAS) have presented contradicting assessments of France’s deal with Egypt on the purchase of Mistral ships, with some saying that the helicopter carriers could come useful in Egypt’s struggle against Islamists, while others speculating that the deal is just a way of saving Paris the embarrassment of a broken contract with Russia. French President Francois Hollande confirmed on Wednesday that a deal has been reached with Egypt on the delivery of two Mistral-class helicopter carriers. According to earlier media reports, France will sell the two vessels, initially set to be delivered to Russia, for €950 million (over $1 billion at the current rates). Russia and France officially terminated the €1.2 billion Mistral deal in August, after it was halted by Paris in 2014 over the Ukraine issue. Paris repaid Moscow around $1 billion in compensation for the breached contract. Egypt is not engaged in any military conflicts that would justify the purchase of Mistral ships, Alexey Fenenko, Leading Research Fellow at the RAS Institute of International Security Studies told RIA Novosti on Wednesday. "Cairo does not need ships of this class, Egypt has no one to fight with using them. Egypt does not have an enemy that would justify the purchase of ships of this class," Fenenko said. According to the Russian researcher, Mistral ships are meant for major operations involving airborne troops that Egypt has nowhere to conduct. "Where can Egypt conduct it [such an operation]? In Libya? The two countries share a land border. In Israel? The relations they have at the moment are not bad and Israel has a total air advantage not only in terms of the number of aircraft, but also pilot training. In Syria, ships of this class are not needed for conducting large-scale operations," Fenenko explained. He stressed that Egypt’s navy is too weak to maintain ships like the Mistral carriers. "Egypt does not have enough coastline or port services that would allow it to maintain ships of this class. Mistral ships are not just two ships, they need specific maintenance by ships of other classes at sea and preferably air cover. It is a very expensive instrument," Fenenko said. The expert suggested that Egypt might have been chosen as the buyer of Mistral ships so that France would not look like the losing party. "Perhaps certain countries want to provide Egypt with real aid, first of all the United States, and demonstrate, in opposition to Russia, that there is a buyer, despite everything," Fenenko speculated adding that the Elysee Palace could just be trying to avoid embarrassment by demonstrating that the Mistral contract was not simply broken, that there are other buyers "already lined up." 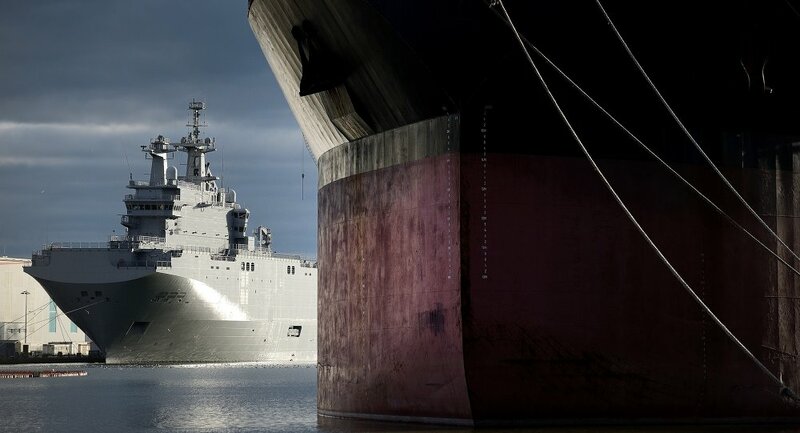 According to Fenenko it is possible that Russia could buy the Mistral ships from Egypt in the future. Boris Dolgov, Senior Researcher at the RAS Institute of Oriental Studies told RIA Novosti on Wednesday that the Mistral ships could come in useful in Egypt’s fight against radical Islamist organizations on the Sinai Peninsula, located between the Red Sea and the Mediterranean Sea. "Egypt is currently facing a direct military threat from radical Islamism. We know that the so-called Sinai Islamic State ["Sinai Province" or "Wilayat Sinai" militant group] is active on the Sinai Peninsula and that terrorist attacks are being carried out on the territory of Egypt," Dolgov explained, adding that Egypt could very well use the helicopter carries against the ISIL-affiliated "Sinai Province" or other extremist groups. According to the Russian researcher, Mistral’s characteristics are well suited for that objective. "They [Mistral ships] are mobile and can quickly get to any area where the army needs support to conduct autonomous operations with the use of helicopters and Marines," Dolgov explained. Dolgov pointed out that amid the extremist threat Egypt has been actively engaged in the modernization of its military, strengthening cooperation with Russia and Saudi Arabia in that sphere. The expert speculated that Egypt’s recent loans from Saudi Arabia could be used for the purchase of Mistral ships. Apart from radical Islamists, Mistral ships could also be used in the fight against Somali pirates, Vladimir Belyakov, Leading Research Fellow at the RAS Institute of Oriental Studies told RIA Novosti on Wednesday. Belyakov agreed with Dolgov in that Egypt needs Mistral ships to counter the terrorist threat along the Mediterranean and Red Sea coasts, pointing out that Yemen also presents some danger for Egypt as Cairo is involved in the fight against Houthi rebels in Yemen. Belyakov added that another problem that Mistral ships could help resolve is the Somali pirates. "So in my opinion the agreement between France and Egypt makes a lot of sense and is very good for Russia, because we have enjoyed close ties with Egypt in the past years, including in the military sphere," Belyakov said. The expert explained that Russian specialists could help train Egyptian servicemen on the Mistral ships. "The Mistral ships were built in accordance with our needs, so our naval officers can help Egyptians master the technology and armament. This would be a perfect arrangement for us, if the final transaction does take place," Belyakov said. A Russian military source told RIA Novosti on Wednesday that Moscow is unlikely to interfere in the Paris-Cairo Mistral deal, should it be finalized.